NEW YORK (CNNMoney) -- It may surprise you that there is a rapidly growing number of websites Google intentionally hides from you. Google doesn't want that to be a surprise anymore. The search giant said Thursday it would begin chronicling the thousands of requests it receives daily to take down search results that link to copyrighted material. Google (GOOG, Fortune 500) said it receives upwards of 250,000 requests to remove links to pirated content each week. 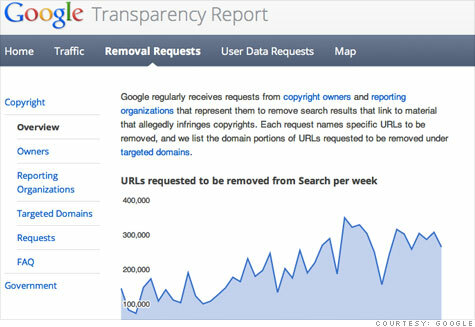 For the first time, the company added all of the removal requests for search since July 2011 on its online transparency report. The two-year old report initially just displayed government requests to take down content from Google's servers. But it now includes copyright holders' requests, which dwarf the number of take-down requests from governments. It's a lot to keep track of, but Google has good reason to want the public to know about removal requests for pirated search links. In January, the company fought hard -- and won -- against two congressional bills that would have cracked down on copyright infringement by forcing companies such as Google to refrain from linking to those sites. The current U.S. anti-infringement law, the Digital Millennium Copyright Act, puts the onus on copyright holders to notify Google when it is displaying or linking to pirated material. The controversial Stop Online Piracy Act and Protect Intellectual Property Act would have shifted that onus to Google, putting it on the hook for content that it links to. Google is trying to demonstrate that the current system works just fine. Despite the incredible ramp-up in requests, its average turnaround time for removing content that infringes on copyrights is 11 hours. "We believe that the time-tested 'notice-and-takedown' process for copyright strikes the right balance between the needs of copyright owners, the interests of users and our efforts to provide a useful Google Search experience," said Fred von Lohmann, Google's senior copyright counsel. When copyright holders believe there is content Google is linking to that violates their copyright, they first fill out a form on Google's website. Google's computers will then try to determine whether the claim is legitimate. After an automated review, a human will take a look at the request as well. Google said it ultimately approves about 97% of the requests. But the company insists that it is working hard to weed out illegitimate claims. For instance, Google said it recently rejected a request from a major entertainment company that asked the search leader to remove a result that linked to a newspaper's negative review of a TV show. Determining what's kosher and what's not puts Google's team of copyright lawyers in a difficult position, especially as the requests grow astronomically. But the group, based in its Silicon Valley headquarters, would rather maintain the status quo than face government intervention. "We've been working with copyright owners for years to make this an efficient process," said van Lohmann. "As policy makers look at potential copyright law changes, we want to make sure they have the benefit of actual data."